hi, i have heard you have an ad on google, cpould you please send me the image file so i can download it and put it on my site? i want to advertise for yola because its great! I am looking into this ok! Will get back to you here soon. it will be on my site imediatly! emmy not to be a pain or anything but how long will it be? What would be cool is a badge we could get right off the Yola site. 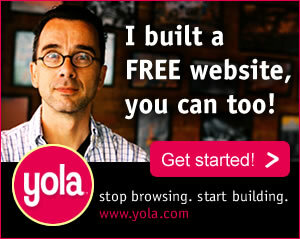 yea, a badges page with the HTML code for different yola ads! You can use the logo from our home page if you would like and link it to yola.com. scroll down 2 the bottom, its there! Here are some of the ads we are currently using that you are welcome to put on your site. We appreciate your desire to do this! thans emmy, saved to PC! on website soon. will there be a Yola movie ad? We will have to work on this. I am sure we will do one at some stage. Thanks for sharing advertising space on your site with us! thanks monique, its okay, i am proud to shot out and share Yola!